© 2016 NFPA, reproduced with permission. 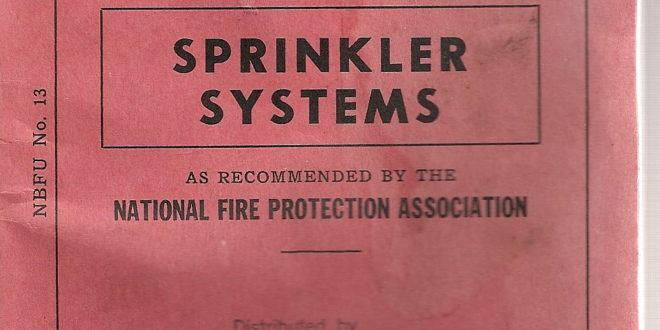 Many of you cannot identify with the term “Red Book,” but back in the late 1950s the fire sprinkler business was governed by the “Red Book,” which was always carried in your hip pocket. Back when the states had their own “Inspection Bureaus” and we lived daily under its authority along with the Factory Mutual companies and the Factory Insurance Association. 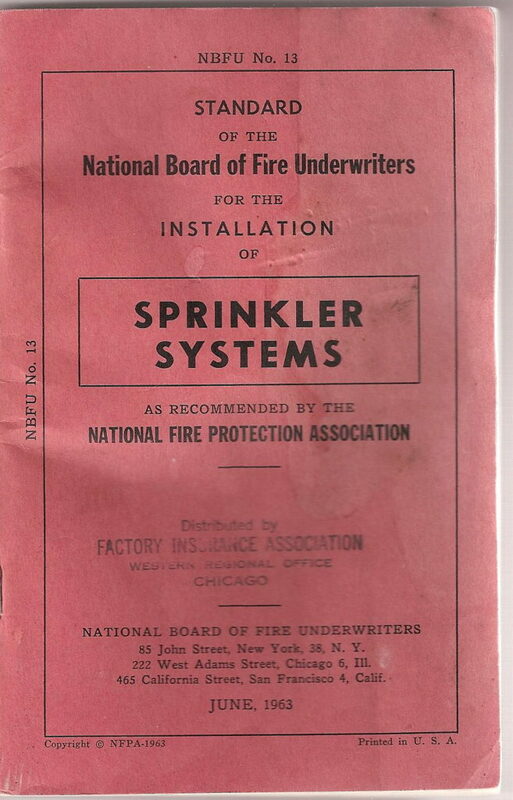 The photo shown here is the Red Book (NFPA 13), which I had in 1963. Building owners in those days only sprinklered their buildings for insurance savings. 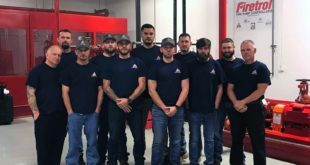 Normally, a building owner could pay for their sprinkler system within three to five years and from there on would be saving insurance dollars. The industry at that time was focused on this direction and we as contractors could sell sprinkler systems based on insurance savings. During those days all fire sprinkler fitters carried their Red Book in their hip pocket along with everyone else. 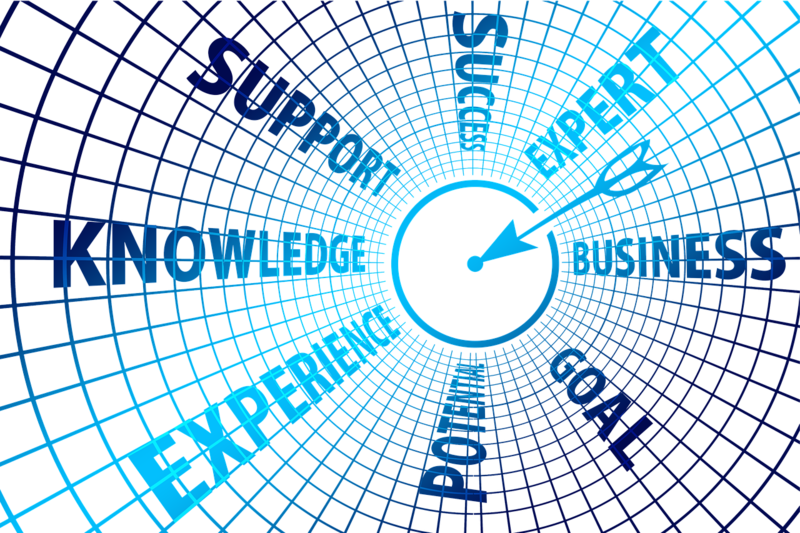 At this time there were no hydraulic calculated systems. They were all pipe sized according to the pipe schedules therein. Since the late ‘50s the industry became involved in life safety in nursing and convalescent homes, some schools, all due to deaths due to fires in same. I know in Iowa that we passed a law that all nursing homes of certain specifications had to be sprinklered accordingly. As time has progressed, the “Red Book” had to be added to or changed accordingly. 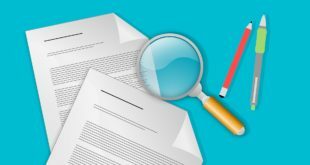 Today, too, building codes have been written that require certain buildings to be installed with fire sprinklers before they are allowed to be built. Many NFPA 13 changes such as hydraulic calculated systems and other detailed occupancy items have become a part of NFPA 13 and now it has gone from 146 small pages to 488 large-size pages in NFPA 13, 2016 edition. Also, additional editions of NFPA 13D, NFPA 13R and other added standard types have been made separate. I know it may be hard to identify with the old days, but it was a way of life for those working full time in the fire sprinkler business as owners, designers, and fitters as we all carried our Red Book in our hip pockets. We all had the pipe schedules memorized for all “on-job” use. I thought I would share this so that many of you might identify with the early part of our industry. ABOUT THE AUTHOR: Don Becker, former AFSA Chairman of the Board, was president and founder of Midland Automatic Sprinkler Co., Inc., Kansas City, Mo., prior to its acquisition by Grinnell in 1999. He also served as AFSA Region III Director for many years. Becker is certified as a NICET Level IV Senior Engineering Technician. 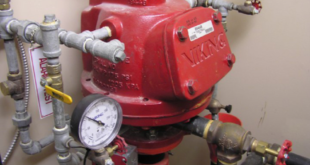 He is a member of the NFPA 13 Correlating Committee on Automatic Sprinkler Systems. This is the committee that oversees all the individual NFPA 13 technical committees. Becker serves as chairman of AFSA’s Technical Advisory Council.